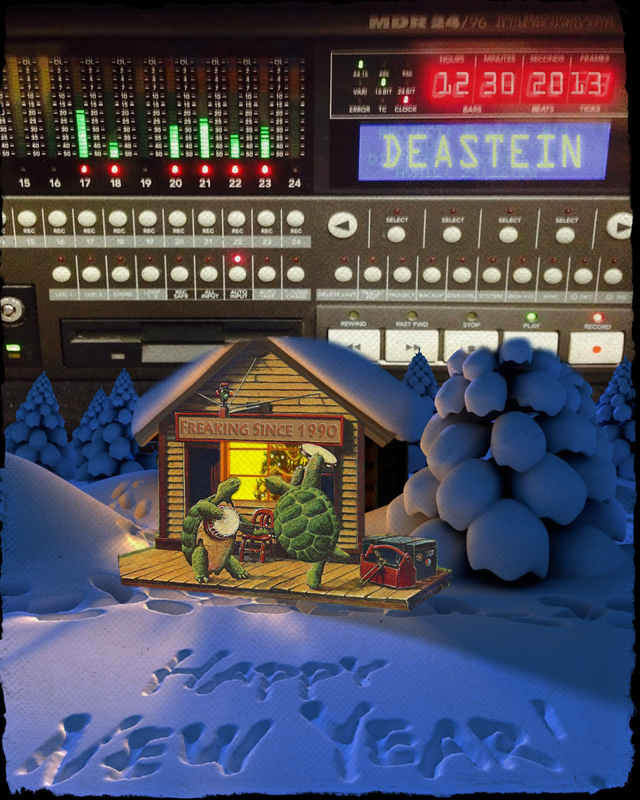 “Freaking Since 1990” is what the sign a top the Terrapin’s cabin says and this jam, the night before New Years Eve 2014, was a jam to commemorate not only the new year but also the longevity of Deadstein itself. Still playing Deadstein into 2014 has a nice ring to it. Happy New Years and a freaky 2014 from Deadstein to all the freaks out there. Deadstein is going strong after all these years and the 53rd jam of the year is a testament to it. This holiday season was a challenge to keep the freak parade going with everyone’s busy schedules, but some how we did it and didn’t miss a beat from a scheduling perspective. Not skipping a beat while playing is a whole other matter. Scott was our only missing person this week as he was busy filming one of the many shows he has been to over the season. While Scott films, I continue to record the jam sessions with my Mackie MDR 24/96 multi-track hard disk recorder. While you think 53 jams is going strong, how about 20 multi-track recordings since August. That is quite a bit of high quality music to remember 2013 with. Deadstein has long been a believer in archiving its music and the merriment that accompanies its weekly jams ever since day 1. Over the past week or so, the Deadstein.com jams database has been updated with reference to adding the remaining Deadstein blog posts since the first days of blogging beginning in July 1996. Some say Deadstein invented early blogging, but I think it is only Al Gore and Kevin who make that claim. Previously, the database had only gone back as far as 1998. With this update, I was also able to find and include classic Kevin setlist artwork from the second half of the 1996 time-frame. These setlists had previously only existing on paper and never included on the web at Deadstein.com. Look for some of this new-old-stock (N.O.S.) artwork to pop up randomly throughout your Deadstein.com travels. Finally, speaking of archives, I continue to trickle in and update some of the classic recordings from the earliest days of Deadstein as I find time to digitize and upload the original cassettes. 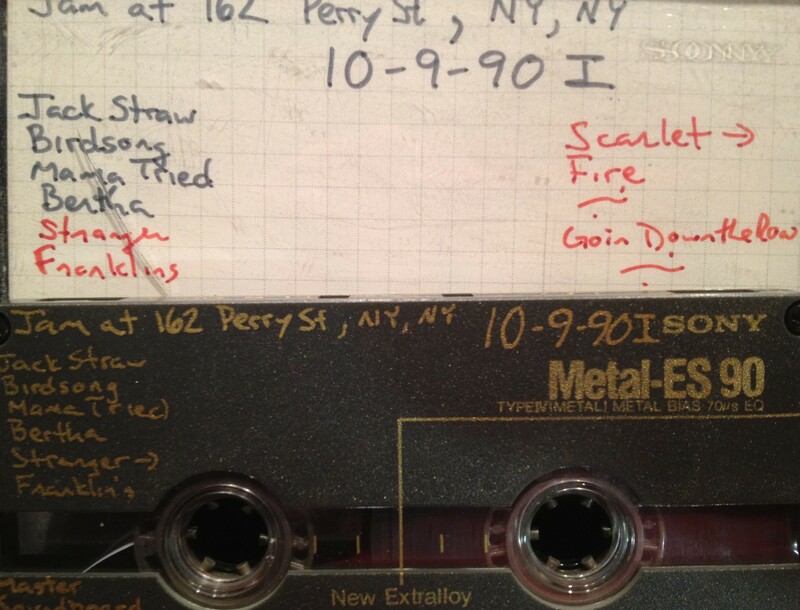 This week I uploaded 11-5-90 jam from 162 Perry Street. Getting back to the end of 2013, with New Years Eve falling on Tuesday night, a Monday night jam or Thursday night jam were the only hopeful nights to jam so we selected Monday without Scott. Lee filled in quite nicely by himself. We were already in this Monday jam mode from the previous week as we were impacted the same way by Christmas. It did kind of force us into one last jam of the year, number 53, which I like, but it also pushes of the first of 2014 up a little. We are going to have to keep our focus in 2014 to keep the jam frequency up at 2013 levels. Getting into the jam seemed easy this evening as it seemed none of the world was working. I was working but was able to get in early and setup seemed quick and easy, not much moved from the previous week in Studio B. Getting out of the jam was not nearly as easy for me. It was a frigid night in the metropolitan area and I was psyched to be in my warming car after the at 12:20 heading to the Lincoln Tunnel down 11th Avenue, when – BOOM – I hit a giant pothole. That woke me up a bit. Just before I was to pull into the Lincoln Tunnel entrance I decided to pull over at the Javitz Center to just check on my tire. Sure enough, it was hissing louder than my 1990-cassettes . Changing this flat in 20-degree weather was a real awakening. After about 30 minutes of very difficult work in the cold I was off and running with my doughnut The ride home was exceptionally squirrelly but I made it home by 1:45 and was fortunate to get the tire(s) changed the next morning before the place closed at 1pm for New years and before the impending snow and cold weather pattern to follow. “When life looks like easy street there is danger at your door.” Let’s be careful out there in 2014 and remember it’s not 1990 anymore. Speaking of 1990, like our first jam in 1990, we opened this one up with a Jack Straw and it felt pretty good and that feeling continued through the El Paso. The misplaced first set Scarlet had trouble garnering the respect it deserved and the Fire even less so as it took Kevin probably 1/2 the song to remember that Fire typically does follow a Scarlet. With this said, it had its movements, which it better have had some, because at 26 minutes, if it doesn’t have any moments, I mean, WTF? Minglewood Blues brought us back into form and Push Comes to Shove knocked us right out of it. The Cats, You Win Again into Music Never Stopped was the closer of the first set which ended up being pretty hefty. I think my resolution for 2014 should be to learn how to jam on Music Never Stopped correctly. I always feel so inept while jamming that song. We took a very long break, I think we all felt a bit satiated with our accomplishments of the evening and 2013 and felt as if there was little else to prove. In many respects we are right and the second set seemed a bit difficult to muster up the required enthusiasm. The Estimated into Terrapin was well executed for the most part, but another mini-break after the Terrapin meant whatever was reaming for the year (Gomorrah, Evangeline and Midnight Moonlight) would be petifores at best, as all the beef for the year had been devoured long ago. Not to fret because the butcher has a load of fresh bloody meat to deliver for our consumption in 2014. For 53 jams in 2013, Freak Out! With Alan vacationing, enjoying some warm tropical weather, Deadstein would have to brave the cold weather outside to enjoy some of the nice “woo” inside. Joining us at the unlimited table of “woo” in lieu of Alan for the second time was Fred. With Fred on lead and me playing Bobby, it made for a strong night of music. We only had Steve in as our guest for the night, so there was little to disturb us in our quest to play good music. This kept us moving forward with determination. The equipment seemed fine so we had few excuses to make, and listening to the the recording should hopefully bear this out. Scott had just come from a show seeing a performance of Dylan’s “I’ll Be You Baby Tonight” so we decided to take a crack at that song and had a good time with it. It was good that we selected to do it early on because we were focused and stayed with it. We also had a 1972 vibe going on during the first set and did a nice He’s Gone –> Truckin’ –> Birdsong triple combo, extra meat and no tomato, if you know what I mean. This seemed to be the main entree of the set. By the time the second set hit, we needed some help. I had just showed Fred how to use the Deadstein.com online song database to access PDFs of song write-ups. He noticed the Rand-O-Matic portion of it and I demonstrated it. Next thing we know, the clutch Rand-O-Matic pulled a very entertaining night of 2nd set jamming for us out of its gorilla glass and on we went. Another pat on the back to Deadstein.com. Deadstein’s first jam occurred on October 9, 1990, 22 and a half years ago. 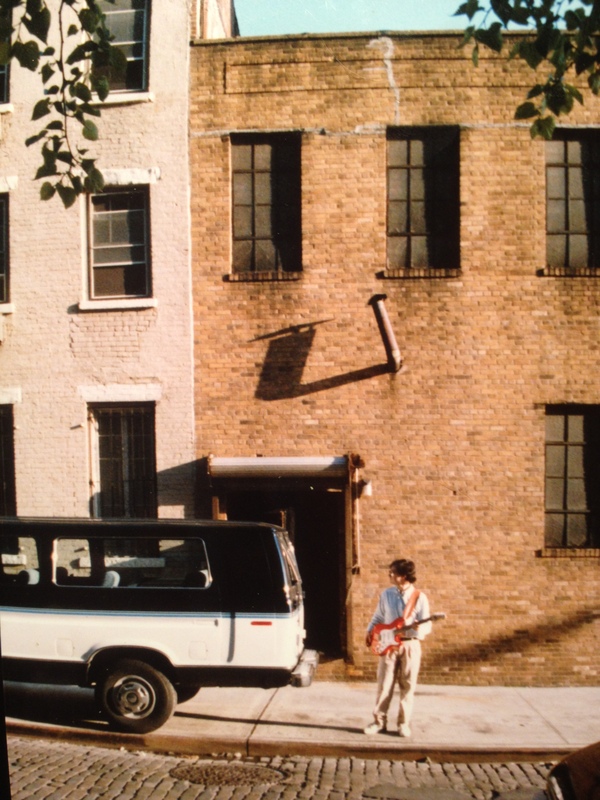 We played at Richie Haven’s/Dennis’ rehearsal studio/home at 162 Perry Street, NY, NY. Up to now, the music from this historic jam was only available on the few original cassette tapes that may be floating around. I found mine floating around and decided to digitize the music, master it and post the subsequent MP3s on the original web page for this jam. Click here to view the webpage and and read about the jam as written several years after it happened. This first tape is a soundboard mixed for us live by Dennis in his studio. There is so much to understand about the evolution of Deadstein by listening to this first jam. You can hear the strong foundation that would eventually be the Deadstein sound. In many respects, we were better back then. We were much closer to the Grateful Dead as they were still creating music and the hope of the Grateful Dead was alive in all of us, well maybe not Dave. It was great listening to this jam for me while making it, and it may be fun for you also. Enjoy. It was another very interesting night of Deadstein. There were several cool features of the night that made it one of the more memorable evenings of Deadstein. We had the whole band back together for the first time in a while. Then we also had the use of the new Jerry Garcia Song Book, version 8, for the first time as a normal part of the evening. Lastly, I have to mention the presence of Howie Weiner. 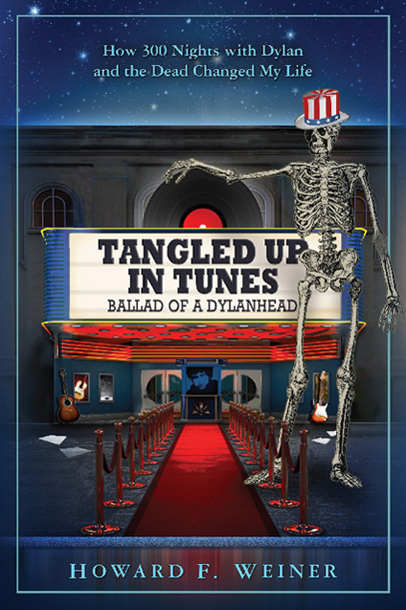 Howie is the person who wrote the new book Tangled Up In Tunes, which I just read and recommend highly to everyone, but in addition, he’s an old friend that I went to several Dead shows with. I know Howie because he was Doug Schmell’s friend growing up in his high school days while turning into a Jerry-head as explained in the book. I haven’t seen Howie probably since 1985 or so and due to the Facebook and the publicity associate with his book, we got to talking. He lives in the city what do you know? Ying-Yoink, next thing I know is Howie is at a Deadstein jam. Alan came in with the notion of doing the Swing Auditorium Grateful Dead show from February 26, 1977 and it was funny how he suggested it and Howie kenw the Swing from the feb. 26 date. Nevertheless the jam’s date was actually February 22 and the Swing Auditorium show was February 26 and therefore, I had no real connection to doing that set list. This was probably to be disappointment of Alan and the detriment of the evening. Coming off of the jam that we just followed a set list, the February 17 show from last week, I wasn’t too anxious to do another set list for some reason. For the most part for the first set we let Howie pick the songs and he lead us through a typical normal sounding Grateful Dead set list that was cool, as if I was going selecting the songs myself, pretty funny I thought. For the first set, we played well, we played hard, and we played with purpose getting us some good music. I thought our Cumberland Blues was one of our better efforts for that song. Howie stayed for the first set and left after the Playing –> Let It Grow –> Playing, which ended the first set. It was great to see Howie and I’m sure we will see him soon. We took a half time break at that point. It was a pretty long one which obviously was a mistake. It led to a second set that was played with a lot less zeal then the first. Scott was zoning and was in no mood to do anything too long and spacey which at that point would definitely knock him off his throne. Therefore we found our way into doing many a Beatles song. Scott requested the Abbey Road medley and somehow we did it. I mean we had a stumble or two but nothing that a nice Rich Brotman cut and paste couldn’t resolve. It was a good, fun effort on our part. Besides the new book, which is exciting and you hear me blogging about it quite a bit at this point, I also was very excited to unveil the new Deadstein.com website to everyone at the jam. Deadstein.com has been down for probably two or three years now ever since I kind of crashed the server. I finally got it resolved not too long ago and over the weekend made the effort to get the website back up and running. In essence I resurrected it from its death and I’m looking forward to having a little fun with it at this point. I’m sure Kevin’s going to be liking it. I’m probably going to post its own blog post related to the resurgence of Deadstein.com so look for that somewhere later on but it’s a nice portal through all or Deadstein social networks for whatever that means to anyone, which probably isn’t much, but it’s gonna be fun anyway to look back on the past into using Deadsteam.com as a conduit back to the past as well to helping us play during our jams. In closing on this jam, I have to mention the other guest, Scott Bayer with his bongos. He was about to start playing on doing the Abbey Road medley and I definitely had to call him on it and tell him to not play during it. The Don’t Let Me Down that we tried was pretty disastrous, amazing like that song has to be so difficult and much of the second set was not our best effort. As so often is the case. You’ll be able to listen to the songs on MP3 once Rich posts them, so look forward to that. I’ll get them up there as soon as I can. Please take a look at the new website and start interacting on one of the multitude of social networks that I am giving us all access to. I especially have some hope with respect to using Google+ with its hangout features where we can actually potentially go over songs vis-à-vis video conference call and get some practice done at home what he think about guys? Well, until next week, Freak out! The night represented the retun of Jason to the scene and we meandered our way nicely through the night. We had some great stuff including the hot Morning Dew to set the pace of the night. Click here of the link below to go to this listen to this evenening music. There are several back-logged jams posted previous to this from mid-November 2008 to now that I just caught up on. If you have anything about those night to add, please do so. I made a few YouTube videos from one of the nights Trister and Scott from Ha;fstep p;ayed with us, so check that out. I could have easily missed a night or mis-dated it especially since the date on my digiital camera was not accurate. YouTube on our weblog? Why not? Click here to view instructions on how to post a YouTube Video within your post. When you find a nice one share it with the rest of us. For instance below is the Good Night Irene I think of every time Kevin errantly says “Ggood Night Irene, Brrrp!” at around 11:25 every jam.